TOP VIEW: A huge star-forming region is rotating globally in the direction shown by the white arrow. This large region can give birth to multiple stellar systems. MIDDLE VIEW: A detailed view inside the large star-forming region shows three protostars forming as the region collapses. The collapse process is chaotic and can cause eddies, allowing newly-forming stars to rotate in different directions and at different speeds, as shown by the arrows. 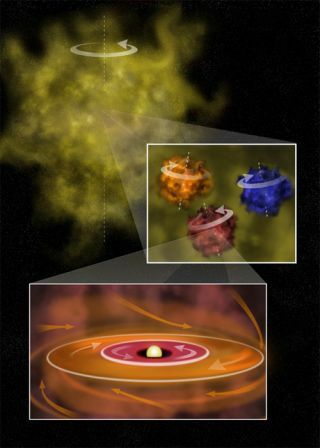 Adeveloping star has been found to have two disks of material rotating inopposite directions. The discovery hints at a future solar system with planetsgoing this way and that. "Thisis the first time anyone has seen anything like this, and it means that theprocess of forming planets from such disks is more complex than we previouslyexpected," said Anthony Remijan, of the National Radio AstronomyObservatory. When starsform, they collapse from a cloud of gas and dust. A ring of leftovers generallydevelops and rotates in the same direction as the star. From the disk, planetsform. "Thesolar system that likely will be formed around this star will include planetsorbiting in different directions, unlike our own solar system in which all theplanets orbit the Sun in the same direction," said study co-leader Jan M.Hollis, of the NASA Goddard Space Flight Center. Thediscovery, announced today, suggests the star was born in an unconventionalmanner. The whole setup sits within a large, star-forming region where chaoticmotions cause clouds to rotate in different directions. "Wethink this system may have gotten material from two clouds instead of one, andthe two were rotating in opposite directions," Remijan said. There isenough material to form planets from both parts of the disk, Remijan said. The findingwas made with the National Science Foundation's Very Large Array radiotelescope. Material moving toward or away from the telescope emits radiation atdifferent frequencies, just as the siren of an ambulance changes pitch when itmoves toward and then away from you in what's known as a Doppler shift. Thecounter-rotation is not entirely surprising, "since the phenomenon has beenpreviously reported in the disks of galaxies," Hollis said. The resultswill be detailed in the April 1 edition of the Astrophysical Journal.